Tablet Explosion: Are you charged up? Have you noticed the explosion in the Tablet market? If you think I’m talking pharmaceuticals, then you’ll be disappointed. Every month there seems to be the launch of a new tablet. Everyone is getting in on the action and with some of the low price points; the Apple iPad is facing tough competition. There’s the popular, Blackberry Playbook, Samsung Galaxy Tabs and the iPad to the latest and cheapest to hit the market, the Amazon Kindle Fire at just $200. Even Sony, Fujitsu, Lenovo, Acer, Toshiba, Asus, Motorola and HP have launched their own versions (just to name the brands – there are more!). HP quickly halted production, but only after selling massive volumes at a reduced price. It will be interesting to see if this has the iMate effect (when Vegemite launched a product that failed – and everyone bought them to hold onto and sell later). Either way…..do you have a tablet? What do you use it for? We have the perfect accessory to accompany your tablet, so it never runs out of battery in the middle of watching a movie, in a client meeting or on that last level of Angry Birds! 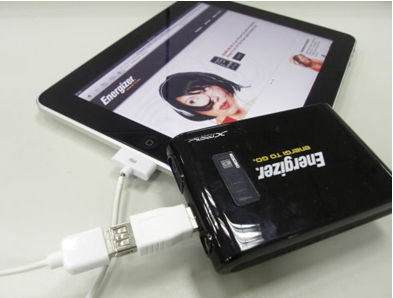 The Energizer® Energi to Go® portable power packs pack a punch when it comes to charging your tablet battery. Many of the above mentioned tablets have quite poor battery life, so this handy solution will help you when you need it most. Below we compare the two most popular battery packs the XP 4000 and XP 8000 to help you decide the best solution. The XP 4001 and XP 18000 are also great options. We’ve also put together a table to highlight the available connectors for your tablet. The folks at XPAL power are always updating this list as more tablets come onto the market. Click here to see more pictures of the whole Energizer® Energi to Go® range and snap yours up today….will be in the mail tomorrow!